jumpthegap® is a biennial International Design Contest promoted by Roca since 2004 with the collaboration of BCD Barcelona Design Center, aimed at creative people who think towards the future whilst designing today. The contest is looking for new, innovative and sustainable concepts for the bathroom space of the future, taking into account that the viability of the project should not limit the creativity of the proposals. These are designs that can bring forth their vision of conceptually futuristic and innovative bathroom solutions: new products, new spaces and/or new uses and functions. The anticipation of users’ new desires and needs, as well as (why not?) the transformation of dreams and desires into reality. jumpthegap® bets for the support of the new generations of designers and architects and offers them an international platform to develop and show their talent. The raise of hyper-emotional consumption brings along the need to live new surprising multisensory experiences. The value of objects decreases and the increasing value of time itself make the consumers search for emotionally intense experiences that may impact on their different senses. The bathroom experience is a very personal moment and, ideally, the bathroom should, therefore, be your private one. If it is not possible, it should at least welcome you in a cosy atmosphere, warm and comfortable. Homing doesn’t necessarily have to be deployed in the high-end products only, but also in the mainstream segment. Bathrooms designed for dependent people have to facilitate the execution of routine tasks. The user should be able to perform them without additional knowledge and/ or special skills in order to minimize the time spent on non-pleasant activities. New products must create the perception of safety and should delay the moment when external help is required to perform the bathroom basic activities. An appealing design and simplicity of the interface should make all special features look desirable. The so-called “Eco products” must be better in every sense. We see that even that the environmental concern of the consumers is growing; they will only adopt sustainable practices if they receive direct, visible and measurable benefits. Being sustainable must be convenient: it must require little or no effort, and it must be very clear what the impact of every action is. Being sustainable must be profitable: it must make the consumer to save resources (i.e. : money) and it must be measurable. Professional category: designers or architects* born from 1 January 1979 onwards. Student category: design or architecture students* born from 1 January 1989 onwards. Entries may be individual or from a group of two professionals or two students. Mixed groups are not accepted. Each person or group may participate in one project only. Judges, their families, their studios or design teams may not compete. The same applies to members of the pre-selection committee and employees of companies that form part of the Roca Group. Winners of any edition are also excluded from participating. *or other related professional/discipline such as building engineer. Registration for the contest is free of charge and available from October 2018 on the Internet (www.jumpthegap.net) and can be accessed through the registration page. All participants must submit their application to take part in the contest by 12:00 hours (GMT+2) on 3 April 2019. When registering for the contest, from 25th February 2019 to 26th March 2019 participants will be asked (optional answer) to introduce the email account of the other valid participant who encouraged her/him to participate in the jumpthegap® 8th Edition contest. The five valid participants of the contest who have encouraged more other valid participants to join the jumpthegap® 8th Edition contest, during this period, will win one of the five tablets Wacom Intuos Pro S 32 x 20,8 x 12cm USB with Bluetooth (hereinafter the “Tablets”) that Roca Sanitario, S.A. will give for free. The names of the winners of the five Tablets will be published on the jumpthegap® website on 6th May 2019. The winners of the Tablets, in order to receive their Tablet, shall contact the jumpthegap® contest organizer by email (jumpthegap@jumpthegap.net) and provide the address where the Tablet should be sent. The cost of shipment will be paid by Roca Sanitario, S.A. If after five days from the publication of the winners of the Tablets, a winner has not contacted Roca Sanitario, S.A. by email, she/he will lose the status of winner and the Tablet that corresponded to her/him will be declared void. The Tablets cannot under any circumstances be exchanged for any other award or redeemed for their equivalent cash compensation. For the avoidance of any doubt, the term “valid participant” in these Rules means a participant: (i) who complies with all the jumpthegap® 8th Edition contest participation requirements and (ii) who has filed a valid project in accordance to the present Rules. One pdf file, containing not more than 2 x A3 size pages. The maximum size of the pdf file will be 1.5 MB. WHAT? What is the project about? For whom? WHY? Why it will be relevant in the future. Any background information or additional details of the project should be placed on the second page. Participants certify that the design is their own, original work and that it has never been published before. 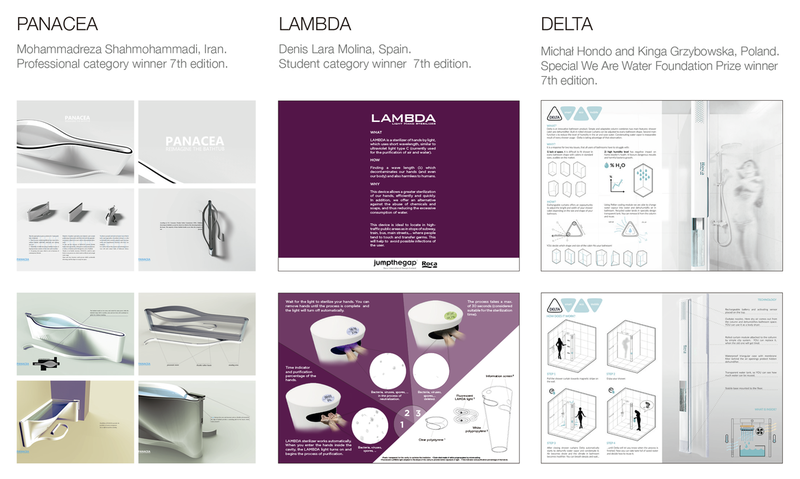 Designs must not have received any award, nor have been presented for any other competition at the time that they are entered for the jumpthegap® contest. The organizers will not, without the written agreement of the participant, alter or amend in any way, the project submitted. The projects must be submitted to the contest website by 12:00 hours (GMT+2) on 25 April 2019. An Independent Moderator has been appointed to act amongst the organizer, the jury and the entrants. For any question, please contact Ms. Cristina Castaño (jumpthegap@jumpthegap.net). Two winning projects will be chosen and will receive a prize of €10,000 each, one in the professional category and one in the student category. One Special We Are Water Foundation Prize will be chosen and will receive €6,000. This mention will be given by the We Are Water Foundation, which has two key goals. The first is to promote awareness and encourage debate among the public and organisations on the need to create a new culture for water, to enable the equitable development and sustainable management of the world’s water resources. The second is to carry out a whole host of actions to counter the negative effects of the lack of adequate water resources. The foundation’s fields of activity include involvement in infrastructure, education, health and research, concentrated in the world’s most deprived areas (www.wearewater.org). In order to be eligible to receive the economic award corresponding to each category (Professional, Student and Special We Are Water Foundation Prize), the awarded person (and in case of groups, at least one of the members of the awarded group) shall be present in the Award Ceremony to collect the award. If the awarded person (or at least one member of the awarded group) is not present during the Award Ceremony he/she (the group) will lose its right to the economic award but will maintain its condition of awarded person/group on the 8th edition of the Roca International Design Contest, jumpthegap®. All taxes on the prize are the sole responsibility of the winner, regardless of his/her jurisdiction. The winner may be withheld with the taxes that are applicable according to the Personal Income Tax, Non-resident Income Tax and according to the provisions of international treaties that may be applicable. Consequently, the winner, by accepting these legal bases, is aware of the tax consequences of any kind that might result from claiming the prize and Roca takes no responsibility for such cause. ● A PR campaign to promote the winning and finalist projects and their authors. ● Attendance to the Awards Ceremony on October 10 (2019) at the Disseny Hub Barcelona (Spain). Roca will cover travel and accommodation expenses for the winners and accommodation for the finalists. ● Special agenda during their stay in Barcelona: participation in some specific visits and meetings. A chance to present their portfolios to jury members and local experts. ● A jumpthegap® official diploma. Winners will also receive a trophy and a digital label to be used on communication channels. ● Participation in a jumpthegap®(talk), if possible, in their respective countries. ● If required, the author/s of the winning project will cooperate with Roca’s Design Department on the manufacture of a possible full-size mock-up or specific material to be used in presenting the project. In May 2019, a pre-selection committee made up of representatives of the Roca Design Centre and the We Are Water Foundation will select 24 projects from amongst the entries received, which will be presented to the juries. 20 of these projects (10 from professionals and 10 from students) will be the preselected. The other 4 projects will be the We Are Water Foundation Prize Finalists. The juries’ selections will be performed on-line in June 2019. The jury for the Professional and Student Categories Prizes will receive a “virtual dossier” with the 20 preselected projects to judge (10 from professionals and 10 from students). They will choose the first 4 projects from each category, which will be the 8 finalists. Amongst the finalists, they will vote a second round and chose 1 winner from each category. The jury for the Special We Are Water Foundation Prize will receive a “virtual dossier” with the 4 finalist projects to judge, from which they will choose the winner. In the event of a tie, the President’s vote shall decide. How well does it meet the overall aim of the jumpthegap® contest? Is it setting new standards for the world to follow? Is it an outstanding idea? Is it breaking new ground for the future? Does it have an “out of the box” approach? Does it show any alternative to other existing elements? Does it look to work in harmony with the environment? Does it look like a great achievement in sustainable design? Does it show an ecologically responsible use of materials and resources (energy and water-wise)? Does it especially emphasize the importance of reusing materials? Does it help or facilitate the acquisition of new hygienic habits more respectful with the environment? Is the overall idea clearly explained and easy to understand? How attractive is it for a user? Does it look appealing, or welcoming? Does it look friendly to use? Are the benefits to the user (such as e.g. : performance, comfort, safety, ease of use, universal function and access, etc) clearly visible? How good is the quality of the deliverables? How carefully is the information presented? Are the images good? A JPG, PNG or GIF format copy of their degree, certificate or diploma, or a copy of the school’s matriculation document if they are students. In the event of group participation, documents of both members will be sent. A copy of their passport or National Document of Identity. The finalists of the Professional and Student categories (4 + 4), as well as the 4 finalists of the Special We Are Water Foundation Prize will have a “Refine” period. They will be asked to complete the material presented with e.g. : original or further high-resolution images, better quality renders or further details about their project. This additional material must be presented within 10 days after the notification. Participants in the contest guarantee to Roca the originality of their respective proposals and that each of them enjoys the unhindered exercise of the intellectual and property rights over their respective proposals. All intellectual property rights, as well as possible industrial property rights over the projects submitted, belong exclusively to their authors. Participants are responsible for the protection of their design submissions by copyright or patent application, prior to submitting them to the competition. All participants (including the winner/s and finalists) assign to Roca and BCD, the rights for copy, reproduction and publication of the projects submitted to the contest, for all countries in the world and for the maximum period permitted by law in each one of such countries for the purpose of promotion in publications of general interest and/or specialized magazines, as well as on the websites, editions and publications of Roca, and/or BCD Barcelona Design Centre, and also on the contest website. Roca will be entitled to assign to third parties, without the previous written consent of the authors, the right of reproduction and publication of the projects submitted by the authors to the contest for the territorial and temporal scope they deem necessary, for the sole and only purpose of promoting the authors projects worldwide. Exceptionally, participants other than the winner/s and finalists who do not wish to publish their work, they must request it in written form to Roca, before 19 July 2019. The winning participant/s offer Roca an exclusive option to purchase the rights to exploit the industrial property rights over their respective awarded work which shall be exercised within the first anniversary from the date of the Awards Ceremony. If this period expires without Roca’s having exercised its purchase option, the author/s of the winning project may freely dispose of intellectual and industrial property rights relating to it. In the event that Roca exercises the aforementioned option, the author’s name must always be mentioned in connection with the design. In the event that Roca decides to develop the design project for industrial and commercial purposes, Roca shall offer to the author of the project a preemption right to perform such development; should the author not exercise such preemption right, Roca shall be entitled to develop the project itself or to engage the services of a third party to do so.